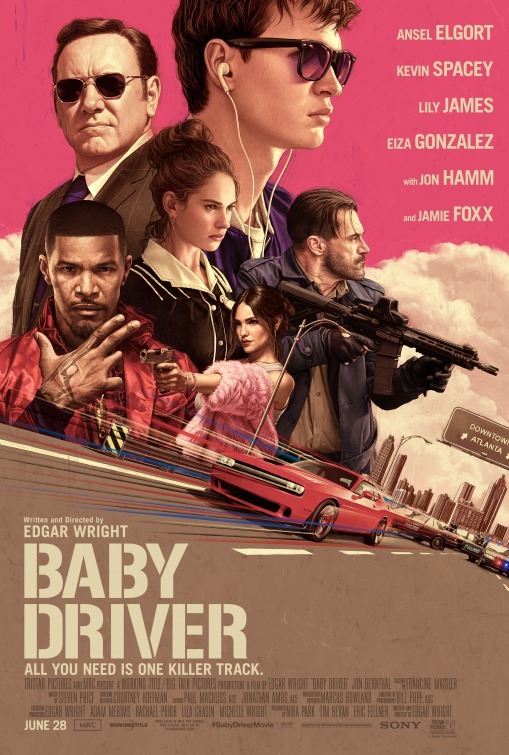 Synopsis: After being coerced into working for a crime boss, a young getaway drivers himself taking part in a heist doomed to fail. I’m not going to make this a secret – I love Edgar Wright. Every movie he’s done I’ve either loved or thoroughly enjoyed to no end. So when he dropped out of Ant-Man and moved on to Baby Driver, I was both a little upset (I was really looking forward toward his Ant-Man) and excited to see what he was going to do with this. Thankfully, from the very first trailer I was completely in. Then the early reviews and reception came out and everyone was saying how great and awesome it was. However as the release date loomed, and the reception kept getting better and better, I started wondering, is it really that good? Yes, yes it is. 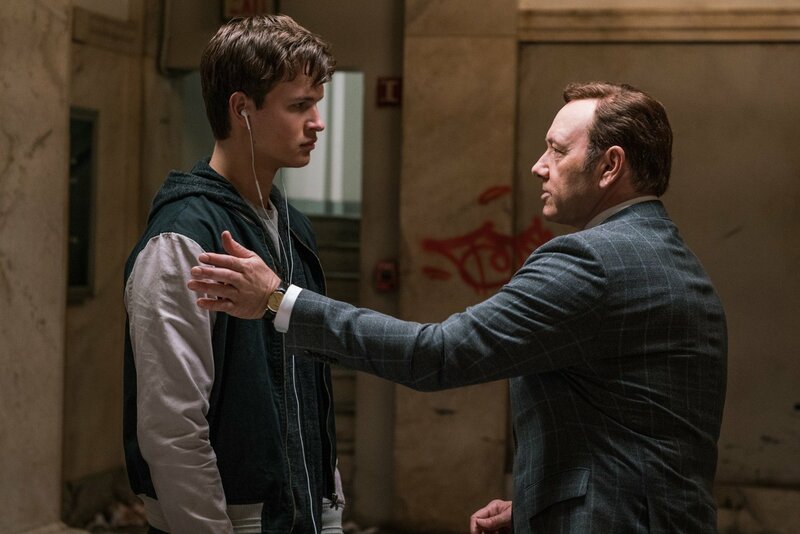 Baby Driver centers on Baby (Ansel Elgort), a skilled, but reluctant getaway driver working off his debut to Doc (Kevin Spacey). However, he’s a not a normal getaway driver, he constantly listens to music to drown out his tinnitus in his ears that was a result from a car accident where he lost his parents as a child, and it’s his inner soundtrack that makes him the best. One day he meets waitress Debora (Lily James), and finally sees a future where he doesn’t have to be a getaway driver. 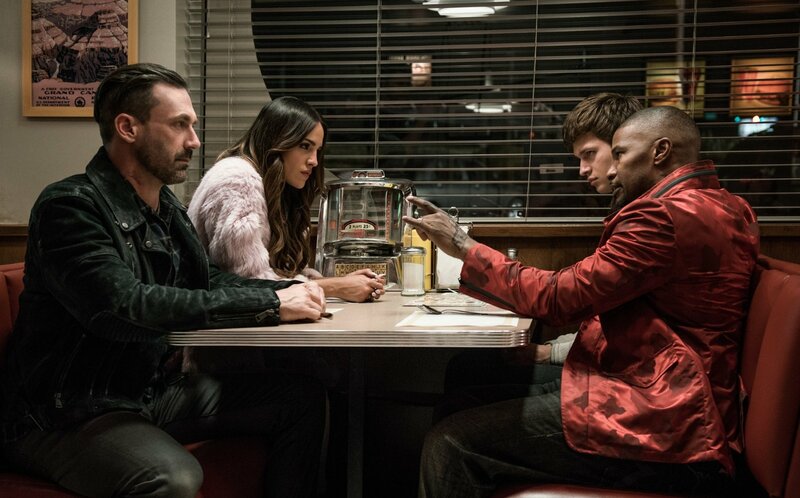 However, as he and Debora get closer, Doc ropes him back into the game on a big job alongside Bats (Jamie Foxx), Buddy (Jon Hamm) and Darling (Eiza Gonzalez). What follows is Baby trying to escape in more ways than one. Like I mentioned, Baby is constantly listening to music and acts like not only his own personal soundtrack but ours as well, giving us a sense at what Baby is feeling at the certain times. At one point, during Baby’s second job working with Jaime Foxx’s Bats – when he’s introduced – JD (Lanny Joon) and Eddie (played by Flea), Baby restarts a song because the timing in off. The funny thing is that it doesn’t come off as awkward or weird, it comes off as funny and almost necessary. I read somewhere that the film is almost a reverse musical, instead of people bursting out into song, its Baby’s music that pushes the story forward a bit. I don’t know how people will feel with music almost constantly playing, but Edgar Wright makes it work so well that it is rather impressive. Also, the fact that the music syncs with the action and the choreography to perfection makes the film that much better. Speaking of the action and the choreography, it’s highly impressive what Wright was able to bring out of everyone, and what he’s able to accomplish with all the car stunts is damn cool. When it comes to the cast, they are also all fantastic. I’m not the biggest fan of Ansel Elgort, but he’s not that bad here as Baby. He’s a man of few words – expect when he’s talking to Debora – and lets his soundtrack and driving do the talking for him. Kevin Spacey chews up every scene he’s in, which isn’t many, but he does leave his impression felt. Jaime Foxx as Bats is, well, crazy and a bit unhinged and does act as the primary villain, although you can argue that they’re all bad guys, expect Baby who’s a reluctant bad guy. Jon Hamm and Eiza Gonzalez play the happy couple of Buddy and Darling, who are crazy about each other and Buddy actually likes Baby and sees something special in him, which plays a bigger factor than you think in the film near the end. Lily James as Debora is, unfortunately, a little underdeveloped. She does have a story behind her, but it’s only her telling it so it could have helped if we’d see a little more of her. Jon Bernthal isn’t underdeveloped, he’s underused. Bernthal is part of the opening heist of the film, but isn’t seen after that. It’s a bit of a shame, but he’s great in the time that he’s there. CJ Jones also appears as Joseph, Baby’s deaf foster father who wishes Baby would leave the criminal life. All in all, Baby Driver is a fantastic film with great car chase sequences with an awesome cast and an equally great soundtrack that perfect fits with the action and how Ansel Elgort’s Baby is feeling. Moreover, while Baby Driver isn’t as personal as Edgar Wright’s other films, it is as stylized as them and filled with more action. Do yourself a favor and go watch Baby Driver in the biggest and loudest theater you can find. 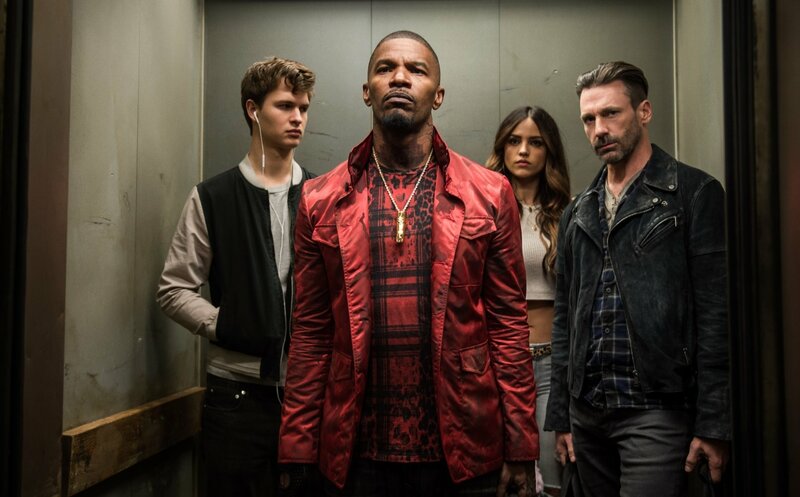 This entry was posted in Movie Review, Movies, Review and tagged 2017, Action, Ansel Elgort, Baby Driver, CJ Jones, Comedy, Edgar Wright, Eiza Gonzalez, Heist, Jamie Foxx, Jon Bernthal, Jon Hamm, June, Kevin Spacey, Lily James, Movie Review, Movies, Reviews, Summer Movie, Summer Movie Season. Bookmark the permalink.